The ruling of Judge Denise Cotes in Federal Housing Finance Administration v. Nomura Holding America, Inc., is a 361 page description of the fraud and corruption that went into just one group of real estate mortgage-backed securities. FHFA was formed after the Great Crash to oversee Fannie Mae and Freddie Mac. These two entities were the actual buyers of the RMBSs offered by Nomura Securities International, Inc., and RBS Securities, Inc., then known as Greenwich Capital Markets, Inc. The Court finds that a number of statements in the offering materials were false at the time of the offering, in violation of Section 12 of the Securities Act of 1933. It awarded a judgment in the amount of $806 million, and required FHFA to tender return of the securities. In this post, I’ll look at several aspects of the case: 1) the legal framework; 2) the discussion of the due diligence tracks the findings of the Financial Crisis Inquiry Commission in its Final Report; 3) the individual liability holdings; 4) the role of the Credit Rating Agencies; and 5) loss causation. is liable to the purchaser for any loss arising from the misrepresentations. The plaintiff has to prove that the offering materials contained an untrue statement of a material fact, and that the purchaser did not know about the falsehood. Sellers can defend by proving that they did not know and “in the exercise of reasonable care could not have known” of the falsehood. Sellers can also reduce their damages to the extent they bear the burden of proving that the losses of the buyer were not caused by the falsehood. The defendants did not claim that Fannie Mae and Freddie Mac knew that the offering materials were full of falsehoods. Thus, the main focus of the decision is the falsehoods in the offering materials. If the Defendants exercise reasonable care in preparing the offering materials, they are protected from liability. In fact, the risks of failing to exercise due care are so great that investors believe that financially strong sellers of securities wouldn’t take the risk of selling unless they had done good due diligence. Of course, our dominant ideology, neoliberalism, preaches that markets, whatever they might be, police themselves, and securities laws are unnecessary. Here’s a lovely example from John Spindler, now a business law professor at the University of Texas (it’s not on his CV). The Final Report also calls out this bizarre idea, beginning at P. 171 (.pdf page 198). The Final Report looks at the due diligence across the universe of securitizers in Chapter 9, page 156 (.pdf page 184). It says that the securitizers did little or no due diligence themselves. Instead, they farmed it out to third parties. These vendors examined a sample of loans from a pool, and reported whether the loans met the guidelines that the originators claimed to follow, whether they complied with federal and state laws, and whether the valuations of collateral were reasonably accurate. They also looked for compensating features that might outweigh the defects. The sample loans were graded, and the securitizers could use these grades to kick out loans, or they could waive the defects, and in either case, they could use the information to negotiate the purchase price for the pool. The Final Report says that vendors reported very high defect rates, and that securitizers waived in a high percentage of the defective loans. The originators then put the kicked-out loans into other pools proposed for sale. Disqualifying defects were discovered in 28% of the loans examined by one vendor, Clayton Holdings, for the 18 months ending June 30, 2007. Of those, 39% were waived in, so that 11% of defective loans were included in purchased pools. The samples were small, as low as 2 or 3%. There seems to be little effort to find the defective loans in the non-sampled portion, so it’s reasonable to assume that a similar or higher percentage of loans in the entire pool are defective. Judge Cote follows a similar pattern. Nomura had no written procedures for evaluating loans. P. 48. After it won a bid for a pool, it conducted a review of the loans, relying on the information contained on the loan tape provided by the originator of the loans in the pool. The loan tape is actually a spread sheet containing information about the loans, including FICO scores, debt to income ratios, loan to value ratios, owner-occupancy status and other important data. P. 31. Nomura sent the loan tape to its vendors to conduct reviews for credit, compliance with originator’s stated underwriting guidelines, and valuation. The due diligence was done on a sample, in the range of 25-30%, but it was not a random sample, so the results could not be extended to the entire loan pool. Of the loans submitted beginning in 2006 and the first quarter of 2007, one vendor graded 38% as failing to meet the originator guidelines. Nomura waived in 58% of those. It also had very high kickout rates for the pools it purchased. That means that of the examined loans, about 22% had major defects, again not counting the unexamined loans. With high kick-out rates, the number of defective loans remaining would be much higher. The offering materials for these RMBSs all claimed that the loans met the originator guidelines with some exceptions. Judge Cote says this was a false statement, and that there was no showing that the defendants had done the kind of investigation required to avoid liability. All five Individual Defendants testified at trial. The general picture was one of limited, if any, sense of accountability and responsibility. They claimed to rely on what they assumed were robust diligence processes to ensure the accuracy of the statements Nomura made, even if they did not understand, or, worse, misunderstood, the nature of those processes. Not one of them actually understood the limited role that due diligence played in Nomura’s securitization process, and some of them actually had strong reason to know of the problems with the diligence process and of the red flags that even that problematic process raised. Each Individual Defendant made a point of highlighting the aspects of Nomura’s RMBS business for which he claimed to have no responsibility. None of them identified who was responsible for ensuring the accuracy of the contents of the Prospectus Supplements relevant to this lawsuit, and, as this group of Individual Defendants furnished the most likely candidates, the only logical conclusion is that no one held that responsibility. A detailed explanation of this summary follows. Apparently securitizers have terrible memories. FHFA did not claim the ratings were false, but that the ratings were not based on accurate information about the actual collateral for the RMBSs. The Court found that the defendants gamed the credit rating agencies models by submitting only the loan tapes prepared by the originators, even when they knew that the loan tapes were full of errors that would affect the final rating. Page 202. The Court found that the ratings depended on factors like the loan to value ratio and the debt to income ratio. The Court found that the LTV ratios were lower than represented by Nomura in 18-36% of the loans, and that many LTV ratios were above 100%, which skewed the models of the credit rating agencies and bought Nomura undeserved AAA ratings. This is a nice piece of lawyering by the legal team at Quinn Emanuel. But there’s no point in shooting at the credit rating agencies. They have a get out of jail free card from the judiciary, which says that they are just giving opinions and are protected by the First Amendment. … there may be circumstances under which a marketwide economic collapse is itself caused by the conduct alleged to have caused a plaintiff’s loss, although the link between any particular defendant’s alleged misconduct and the downturn may be difficult to establish. Defendants do not dispute this. They do not deny that there is a link between the securitization frenzy associated with those shoddy practices and the very macroeconomic factors that they say caused the losses to the Certificates. This lack of contest, standing alone, dooms defendants’ loss causation defense, which, again, requires them to affirmatively prove that something other than the alleged defects caused the losses. The legal team at Quinn Emanuel did a nice job of preparation. The people who prepared the testimony of the expert Dr. William Schwert deserve a special mention: that was really smart. See page 204 and previous material. It looks like the Quinn Emanuel team and the Judge were deeply informed by the Final Report, and used it as a road map to digging up and presenting evidence of the fraud and corruption in the securitization process. It’s a terrible shame the spineless prosecutors at the Department of Justice couldn’t grasp the point of the Final Report. That is, unless the prosecutors did understand, and the decision was made by the neoliberals at the top, Lanny Breuer and Eric Holder, and the bankster’s best friend, Barack Obama. Why Is Thomas Perrelli Negotiating a Settlement If the Banksters Didn’t Commit Fraudulent Actions? Well, first, on the issue of — on the issue of prosecutions on Wall Street, one of the biggest problems about the collapse of Lehman’s and the subsequent financial crisis and the whole subprime lending fiasco is that a lot of that stuff wasn’t necessarily illegal, it was just immoral or inappropriate or reckless. So you know, without commenting on particular prosecutions — obviously, that’s not my job; that’s the attorney general’s job – you know, I think part of people’s frustrations — part of my frustration was a lot of practices that should not have been allowed weren’t necessarily against the law, but they had a huge destructive impact. And that’s why it was important for us to put in place financial rules that protect the American people from reckless decision-making and irresponsible behavior. FHFA has sued 18 banks, a number of them for fraud, most of them in federal court. As part of those suits, it has sued a number of named individuals. DOJ, however, seems to have no interest in all those entities accused of fraud. More troubling still, mortgage servicers have, in sworn depositions, admitted to fraud of a variety of types. The Administration needs to be asked not just why no big banksters have been prosecuted, but also why in the face of massive fraudulent actions, DOJ is choosing to settle, rather than prosecute. https://www.emptywheel.net/wp-content/uploads/2016/07/Logo-Web.png 0 0 emptywheel https://www.emptywheel.net/wp-content/uploads/2016/07/Logo-Web.png emptywheel2011-10-06 14:01:252011-10-06 14:05:10Why Is Thomas Perrelli Negotiating a Settlement If the Banksters Didn't Commit Fraudulent Actions? As Gretchen Morgenson tells it, the headline story from an FHFA Inspector General report on a $1.35B deal Freddie Mac made last year with Bank of America is that the analysis behind the deal was flawed. Freddie Mac used a flawed analysis when it accepted $1.35 billion from Bank of America to settle claims that the bank misled it about loans purchased during the mortgage boom, according to an oversight report scheduled for release on Tuesday. The faulty methodology significantly increased the probable losses in Freddie Mac’s portfolio of loans, according to the report, prepared by the inspector general of the Federal Housing Finance Agency, which oversees the company. 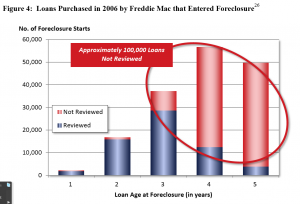 It’s not until the 11th paragraph that Morgenson reveals the underlying issue: Freddie Mac refused to examine whether certain later-defaulting mortgages with unpaid principal amounting to $50 billion–ones originated during the peak of the housing boom–were defaulting because of bank representation and warranties defects before it settled with Bank of America. While it’s unclear how many of the 300,000 loans in this category were Countrywide loans covered in the settlement, of the Countrywide loans Freddie did review, they made buy back requests on 24% of them. So this might represent several billion in problem loans they didn’t make BoA buy back. Back in March 2010, a senior examiner noted that a bunch of mortgages originated during the 2005-2007 period, when Option ARM and Interest Only mortgages were popular, were defaulting later than traditional mortgages–3-5 years after origination rather than during the first 3 years. He posited that the later default date might be because teaser rates were only beginning to end at that point, meaning that mortgages that had affordable for the first 3 years would become unaffordable after reset, leading to default. [I]t would be reasonable to assume that many of the borrowers, faced with significantly increasing payments in the near term and very little equity in their home, made the decision to default before their [payments reset to higher levels]. It would also be reasonable to assume that the stated income and stated asset underwriting requirement played a role, but neither assumption can be tested without a review of the loans. He raised this possibility with his supervisors and later, with Freddie’s senior managers, suggesting they review these later loans to test his theory (they attributed the atypical default pattern to falling house prices). Doing so was important, the senior examiner argued, because at that point Freddie only reviewed loans that had defaulted by the 2-year mark for reps and warranties defects. In effect, Freddie might be exempting a whole class of the most exotic mortgages from reps and warranties review because they didn’t default until after Freddie’s review process stopped tracking them. 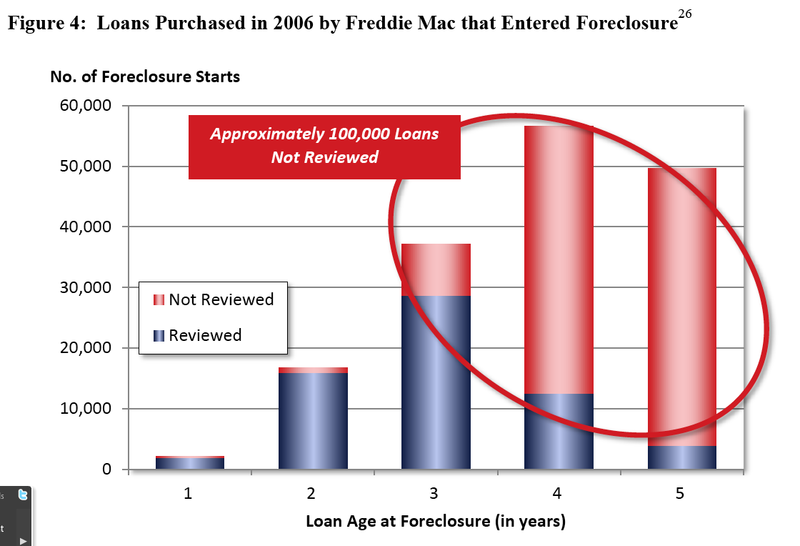 As an FHFA memo made clear, Freddie wasn’t reviewing for defects 93% of the loans originated in 2005-6 that had defaulted in the first half of 2010 (the graphic above shows the portion of loans that weren’t examined). In response to the senior examiner’s concerns, in June 2010, a Freddie senior manager (someone who would report to Freddie’s CEO) agreed to do a review of these loans. But then, weeks later, a different senior Freddie manager stated he was “vehemently against looking at more loans.” That senior manager offered no justification, though others thought such an examination would make little difference and that doing the investigation might lose Freddie BoA’s business. The senior examiner kept raising this issue–to at least 12 different FHFA people, including Acting Director Edward DeMarco. And when Freddie’s internal auditors reviewed the proposed settlement with BoA–which effectively settled all outstanding reps and warranties issues pertaining to Countrywide–they raised this sampling issue, too, and recommended Freddie do a sampling to see what might be included in these other loans. Because they were rushing to close the BoA deal, Freddie looked at a non-representative sample of mortgages (these came from all originators, not just Countrywide, which had a much higher defect rate than other banks) and declared everything kosher. So to review: a senior examiner found $50B worth of defaulted mortgages that Freddie had not examined for reps and warranties and raised a plausible reason they might want to do so. Freddie agreed, then refused, to do so. Then, as Freddie was rushing through this BoA deal last December, Freddie’s auditors suggested they might want to check their math on these loans, so Freddie checked their math on a completely different set of mortgages. In spite of having a 6-month warning that up to $50B worth of loans might be a problem, Freddie signed away any BoA liability for good for the piddling price of $1.35B. Regardless of the cause of these defaults, the search for representations and warranties defects is the point of the loan review process; and if the search does not begin, then the defects will not be found. Like Tom Miller and BNYM, Freddie was “vehemently opposed” to actually examine what they were settling with BoA on. And while we don’t know the cost, we might start calculating that amount in the billions. And in the case of the possible bailout Freddie gave BoA because it refused to look at the loans, US taxpayers paid the bill. Update: I originally conflated the amount of total loans that Freddie hasn’t been reviewing–$50B–with the amount of Countrywide loans in question. For other banks, Freddie should be able to do the analysis and make buyback requests for these exotic loans. I wanted to juxtapose two stories about Fannie Mae. The first, from this WaPo story reporting that the Administration has decided to keep some kind of federal entity guaranteeing mortgages. The story itself is interesting–as are Dean Baker’s post criticizing the underlying decision. What I found particularly interesting, though, were the comments from the usual suspects about the role they perceive Fannie and Freddie as playing. Two top Obama advisers, HUD Secretary Shaun Donovan and Treasury Secretary Timothy F. Geithner, think the government should maintain an outsize role in the housing market, administration officials said. Donovan thinks federal support for housing fulfills a public service, while Geithner has been focused on the need for the government to have a way to keep the mortgage market operating during a financial crisis. Other advisers, however, opposed a continued government role over the long run. Austan Goolsbee, who this month left his job as chairman of Obama’s Council of Economic Advisers, argued that the federal role in housing distorts the free market. By subsidizing mortgage investments, he argued, the government drives capital away from other types of investments — for example, those in companies developing environmentally friendly technology. He also warned that the government is putting enormous sums of taxpayer money on the line while conveying little actual benefit to home buyers. In a meeting with the president, Goolsbee said that the government had finally brought Fannie and Freddie’s excesses to heel by taking over the companies and that it would be a mistake to let them loose in the market again, said a person familiar with the meeting. Goolsbee likened the companies to a villain held in a special prison who shouldn’t be freed just because he promises to help the poor, the source recounted. Lawrence H. Summers, who was director of the National Economic Council until early this year, argued that, over the long term, it didn’t make sense to have a government-backed agency providing guarantees to the mortgage market but that Fannie and Freddie still play a crucial role. Compare those comments–particularly those favoring the GSEs from Donovan and TurboTaxTimmeh–with the description of the way Fannie Mae is fleecing the taxpayers and ruining communities by pushing servicers to foreclose even though homeowners are seeking a modification, an approach that violates Fannie’s own stated policy. The documents show Fannie Mae has told banks to foreclose on some delinquent homeowners — those more than a year behind — even as the banks were trying to help borrowers save their houses, a violation of Fannie’s own policy. Fannie Mae has publicly maintained that homeowners would not lose their houses while negotiating changes to mortgages under the federal Home Affordable Modification Program, or HAMP. The Free Press also obtained internal records revealing that the taxpayer-supported mortgage giant has told banks that it expected them to sell off a fixed percentage of foreclosed homes. In one letter sent to banks around the country last year, a Fannie vice president made clear that Fannie expected 10%-12% of homes in foreclosure to proceed to sale. “Fannie just wants to clean up its balance sheet and get these loans off the books while taxpayers are eating these losses,” [Valpariso University Law Professor Alan] White said, referring to the multibillion-dollar federal bailout of Fannie Mae in 2008 and the rising cost to taxpayers. According to White, the Valparaiso professor, foreclosing on a home typically costs Fannie Mae far more than a successful loan modification. But, he and others say, Fannie is willing to absorb higher losses because it knows taxpayers — not Fannie Mae — will eventually reimburse the loss. It’s as if none of these folks overseeing Fannie know how badly it is screwing American communities. Or perhaps they don’t care?